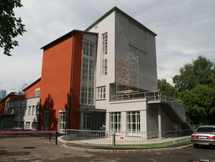 Ilya Alexandrovich Golosov (1883, Moscow – 1945, Moscow) was a Russian Soviet architect. 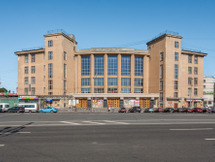 A leader of Constructivism in 1925-1931, Ilya Golosov later developed his own style of early Stalinist architecture known as Postconstructivism. 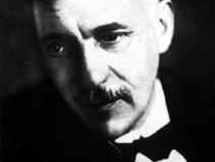 Не was a brother of Panteleimon Golosov, also an architect. Ivan Sergeevich Nikolaev (1901, Voronezh – 1979, Moscow) was a Soviet architect and educator, notable for his late 1920s constructivist architecture and later work in industrial architecture. 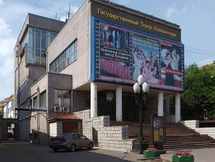 Nikolaev studied at the Moscow State Technical University under Alexander Vesnin and Alexey Kuznetsov,.. 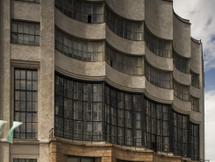 The Zuyev (also: Zuev) Workers’ Club in Moscow is a prominent work of constructivist architecture. 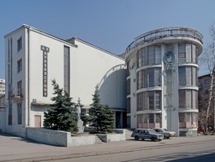 Designed by Ilya Golosov in 1926 and completed in 1928, it housed various facilities to educate and entertain Moscow workers in line with the revolution. The composition of this building is based.. The Svoboda Factory Club, conceived as the Chemists Trade Union Club and also known as the Maxim Gorky Palace of Culture, is a listed memorial Constructivist building in Moscow, Russia, designed by Konstantin Melnikov in 1927 and completed in 1929. 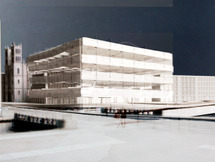 The initial concept for the Svoboda Club was.. 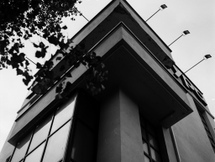 The Rusakov Workers’ Club in Moscow is a notable example of Constructivist architecture. Designed by Konstantin Melnikov, it was constructed in 1927-28. The club is built on a fan-shaped plan, with three cantilevered concrete seating areas rising above the base. Each of these volumes can be used.. In 1930, a competition was held for the Proletarsky District Palace of Culture, to be built on the site of the demolished Simonov Monastery. After the competition ended with no clear winner, the task was awarded to the Vesnin brothers, who had not taken part in the competition. The architecture.. 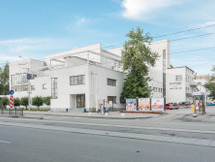 The Communal House of the Textile Institute (also known as Nikolaev’s House) is a Constructivist architecture landmark located in the Donskoy District of Moscow. The building, designed by Ivan Sergeevich Nikolaev to accommodate 2000 students, was erected in 1929–1931 and functioned as a student.. 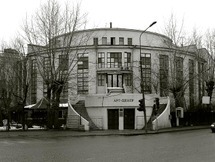 The Frunze Workers’ Club is the smallest and simplest of the five clubs Konstantin Melnikov’s designed in Moscow during his “golden period”. 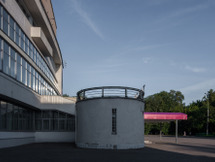 Completed in 1929 on the territory of the Dorogomilov chemical plant, the central rectangular volume of the club, with a roof sloping downward to the rear.. 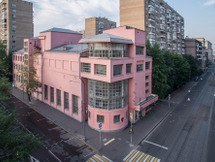 This workers’ club was constructed in 1927-1929 in an industrial area in Moscow for culture and entertainment purposes for the workers from the surrounding factories. The building is an ensemble consisting of an auditorium and different rooms for lecture and education. The Club was commissioned by the cooperative of the Burevestnik shoe factory. The initial concept consisted in a big auditorium with a swimming pool underneath, which could be covered during performance. However, this swimming pool could not be realised because of insufficient water supply. 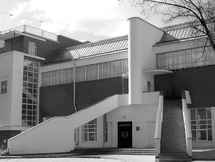 The..
Kauchuk Factory Club is a constructivist public building designed by Konstantin Melnikov and constructed in 1927-1929, located in the Khamovniki District of Moscow on the edge of the Devichye Pole park and the medical campus. 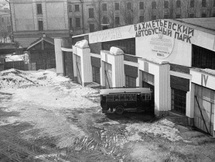 The Kauchuk club is shaped as a quarter of a cylinder, housing a..
Bakhmetevsky Bus Garage was a public bus garage in Moscow, designed in 1926 by Konstantin Melnikov (floorplan concept and architectural design) and Vladimir Shukhov (structural engineering). 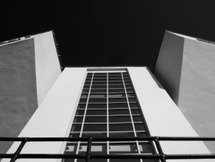 The building, completed in 1927, was an example of applying avant-garde architectural methods to an.. 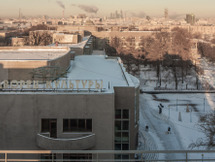 The aesthetics of the Palace of Culture for the Railway Workers is more reminiscent of Art Déco than of constructivism; it has a grooved plaster facade and stands on a granite pedestal. Inside the theater expensive materials like railings bronze and granite posts were used. The first in Leningrad and the USSR was the Palace of Culture (DK - Dom Kultury) which was opened on Stachek Square in 1927 (since 1933 - named after M. Gorky) for the 10th anniversary of the October Revolution. 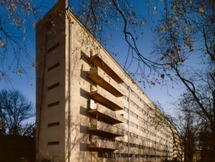 It was erected between 1925 and 1927 after plans by the architects A.I. Gegello and.. The Palace of Culture was built in 1931-38. in Moscow district Fili at aircraft factory #22. This is the first in Moscow so large Palace of Culture with a diverse indoor use. It reminds Palace of Culture ZIL by Vesnins Brothers in its structure and details. The Palace was named after the director.. The Builders 'Club was designed and built in the capital of the Ural - Sverdlovsk (now Yekaterinburg) on the order of the builders' trade union. The project was completed by Yakov Kornfeld in 1929 and contains the most vivid ideas of clubs building in the avant-garde style. The building was.. This project is a contribution to the contemporary debate on the programmatical and architectural future of the Bauakademie in Berlin. 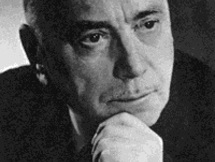 Working on reconstruction is accompanied by a set of questions that expands typical design problems: All future design decision negotiates its justification with..